This cemetery is located at the southeast corner of Academy Boulevard and Airport Road in Colorado Springs. The entrance is on Airport Road, just east of Academy. According to GPS-derived geolocation (accurate to within 10 meters), the cemetery's coordinates are 38°49'25.4"N and 104°45'20.9"W.
This private cemetery got its start when Colorado Memorial Shrine Inc. purchased 40 acres from Willitt T. and Roy I. Pring for $11,000. The Pring brothers were third-generation El Paso County ranchers, owning over 40,000 acres east of Colorado Springs and in other parts of the county. The company received permission from the El Paso County Board of Adjustment to establish the cemetery in December 1951. The plat was filed in April 1952, identifying Garden of the Redeemer as the first section to be developed. After changing hands a number of times, the cemetery was purchased in 1988 by Service Corporation International, a publicly traded company that owns approximately 3,700 funeral homes, crematoriums, and cemeteries throughout the world. In 1997, the Houston-based organization grossed $2.5 billion and handled one out of every nine funerals in the United States. The first recorded burial in Memorial Gardens Cemetery is that of the Rev. Chester Smith on June 20, 1952, although some earlier interments were transferred here after that date. The chapel, mausoleum, and office building, in the southwest portion of the cemetery, was dedicated September 13, 1969. Located on Academy Boulevard, the city's busiest thoroughfare, the cemetery overlooks the Front Range of the Rocky Mountains and is flanked on three sides by apartment complexes. It is professionally maintained and is dotted with young trees, red sandstone section markers, and religious statuary. With the exception of the entombments in mausoleums and crypts, nearly all markers are flush with the ground, to facilitate lawn care. Markers in the Heritage Gardens section, however, are upright. Although this index's cut-off date is September 10, 1997, the project took about two years to complete, and many late 1997 and 1998 burials are included. By the end of 1998, approximately 8,660 interments had been made. The cemetery has several undeveloped tracts of land and can continue to serve the community for a long time. Sexton records for this index were extracted from a card index of burials and checked against lot books. 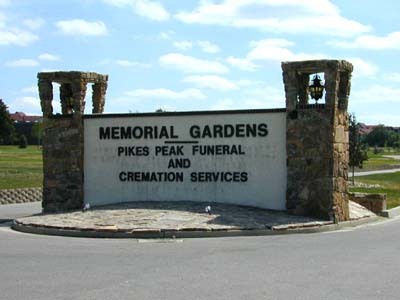 Private files for most burials are also maintained by the cemetery's personnel at 3825 Airport Road, Colorado Springs, CO 80910. Phone: (719) 596-3842; fax: (719) 596-3949. Office hours are 8 a.m. to 4:30 p.m. Monday through Friday, and the cemetery is always open. Mausoleum interiors are locked and can be accessed with the assistance of the office staff. The following codes designate the cemetery's sections for the purpose of this index. If a volunteer found a marker within the block specified by the sexton records but in an apparently different lot or plot, the sexton records' location was retained. If a marker was not in the block specified by the sexton records, the location recorded is where the volunteer found the marker and a discrepancy is noted. Also, some burials have been made in unplatted lots and plots, if space was available. These are designated by an X and so noted in the Comments field.